Mr. Menon serves as Singapore’s High Commissioner to Malaysia. From 2011 until 2017, he was Deputy Secretary of Singapore’s Ministry of Foreign Affairs. 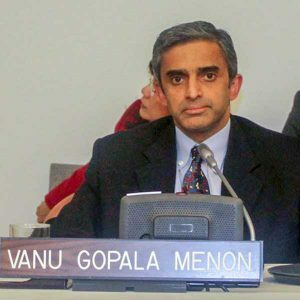 Prior to this, from 2004 – 2011 Ambassador Menon was the Permanent Representative from Singapore to the United Nations. Prior to that, he had been serving as Singapore’s Permanent Representative to the United Nations in Geneva, while concurrently accredited as his country’s Ambassador to Turkey. Menon joined the Ministry of Foreign Affairs in June 1985. He served as First Secretary at the Permanent Mission of Singapore in New York from March 1988 to April 1991, and as Counsellor and later Minister-Counsellor in the Singapore High Commission in Kuala Lumpur, Malaysia, from November 1994 to November 1997. On his return to Ministry headquarters, he was appointed Senior Deputy Director at the Policy, Planning and Analysis Directorate in December 1997, and became its Director soon after. Menon graduated from the National University of Singapore in 1985, with a bachelor’s degree in business administration. In 1994, he obtained a Master of Science in international relations from the London School of Economics and Political Science, University of London, United Kingdom, on a Raffles Scholarship.